The AAA Texas 500 is a Monster Energy NASCAR Cup Series stock car race held at the Texas Motor Speedway in Fort Worth, Texas. The inaugural race took place on November 6, 2005. The race has always started in the late afternoon, gone through sunset and twilight, and ended under the lights at night, much like the Coca Cola 600 in May, but it is not considered a night event. The race is held on the first weekend in November each year; TMS has expressed interest in changing the date, which is also the opening weekend of deer hunting season in Texas. The race was acquired as a result of the Ferko lawsuit, which forced NASCAR to relinquish the sport's fourth major, the Mountain Dew Southern 500 and in the process end its Grand Slam, as the Southern 500 was one of the four races that made it up. This race has been derisively referred to as the Francis Ferko 500, mostly by traditionalist fans upset by the demise of the Southern 500. The trophy is in the shape of a cowboy hat on top of a piston. Traditionally, the winning driver wears a black cowboy hat and fires a couple of six-shooters in the air on victory lane. 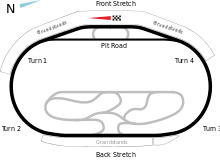 This race is featured in the 2006 film Talladega Nights: The Ballad of Ricky Bobby, but it was actually shot at the identically shaped Charlotte Motor Speedway with the wall painted to look like Texas. Kevin Harvick is the defending winner of the event having won it the last two years in 2017 and 2018. 2006, 2012, 2014 & 2018: Race extended due to a NASCAR Overtime finish. 2014 took two attempts. 2016: Race shortened due to rain. 2008: Carl Edwards' win makes him the first driver to sweep both races at Texas and the first 3-time winner at TMS. 2010: Denny Hamlin became the second driver to sweep both races at Texas when he won the Samsung Mobile 500 and the AAA Texas 500. Also, around mid-race, a shoving match occurred when Jeff Burton and Jeff Gordon crashed in turn 2. 2012: The first 100 laps of the race went green, combine that with the last 234 laps of the April 2012 race that went green, means a total of 334 consecutive laps were run caution free, a full scheduled race at Texas. Jimmie Johnson won, for his 60th NASCAR Cup Series win, and also Chevrolet's 700th win. 2013: Johnson's second consecutive fall win makes him Texas Motor Speedway's second 3-time winner, putting him in a tie with Carl Edwards. 2014: Johnson took his third straight win in the fall race, leading 191 of 341 laps. On a green-white checkered restart, Brad Keselowski tried to go three-wide and made contact with Jeff Gordon, cutting Gordon's left rear tire and causing him to spin in turn 4. Gordon lost a lap and finished 29th while Keselowski finished third. Tempers boiled over, escalating into a post-race brawl on pit road between Keselowski, Gordon, and their pit crews that was apparently instigated by Kevin Harvick. 2015: In the 2015 running, Jimmie Johnson grabbed his fourth straight win in the fall race, and became the third driver in the track's history to sweep both races at Texas, as well as winning his third consecutive event at the track. Brad Keselowski led 312 of 334 laps (a track record). Dale Earnhardt, Jr. tagged the wall with his right-rear corner. This affected the handling of his car and he began to fall back through the field. He spun in the turn 3 apron on lap 167, Kevin Harvick made an unscheduled stop with 53 laps to go for a flat right-rear tire. He fell to 20th–place in the running order and down a lap. Carl Edwards kicked off the final cycle of pit stops with 38 laps to go. Keselowski hit pit road with 37 laps to go and the lead cycled to Harvick. Denny Hamlin was tagged for speeding on pit road and was forced to serve a drive-through penalty. On 16-lap older tires, he was no match for Keselowski as he was passed with ease with 35 laps to go. 2016: Originally scheduled to be broadcast on NBC, the 2016 running was moved to NBCSN due to inclement weather, Carl Edwards grabbed the win after the race was called for inclement weather. 2016: Originally scheduled to be broadcast on NBC, the race was moved to NBCSN due to rain delay.